This vintage postcard features an illustration of a child immersed in playing chef on the kitchen floor. 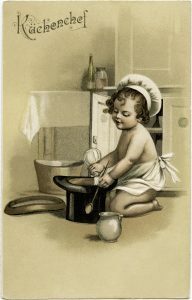 This little chef, dressed only in an apron and chef’s hat, is using a top hat as a mixing bowl for the food he or she is preparing. The greeting on the postcard is a single word, “Kuchenchef”. A Google translation indicates “kuchenchef” is a German word that means “cake chef”. Oh, this is sooo sweet! Love it! You’re welcome Kay. I’m happy to know you love it!